so the lesson here is don't park your car and rev the hell out of it trying to impress the ladies. How do new engines have diesel runaway problems? Usually it happens on older, worn out engines. And yeah, it's pretty hard to stop. If you have a stick shift, you could potentially stop it by putting in the last gear(5 or 6) and dump the clutch to stall the engine. On an auto you are pretty much SOL unless you can find a way to block the air intake. So do automatic Mazda cars don't have a lower rev limiter in N? I recall that I was revving in N once in my old Accord V6 5AT and there was actually a fuel cut at 5k RPM(redline is at 6800 RPM). Supposedly the manual ones let you rev to full redline. australia gets the CX-8 with a Diesel and yet still no word for us lowly Americans. If anything, I think a hybrid CX-5 makes a lot more sense. Mazda is partnering with Toyota right now, who has mastered the hybrid system. **** on Prius all you want, but it has a proven and reliable hybrid system. It will get you the same, if not better, fuel mileage a diesel can give you, with adequate power. And while a diesel may have peak torque at 1500 RPM, an electric motor has its peak torque at 0 RPM. It's also probably a lot easier to market a hybrid vehicle than a diesel. Driving engagement? Well then don't buy an SUV! Drove a BMW X3 and that was a snooze fest when not floored and unrefined POS when floored. I don't have high expectations for SUVs. Looks like the CX-5 Diesel finally finished EPA fuel economy testing. So, with no fuel economy benefit, and diesel fuel typically being more expensive than premium gasoline in most US locations, why would anyone buy this again? Shocked the numbers are that low . At least they aren't lying about it like certain other company. With those numbers you may as well just buy a hybrid SUV. Better fuel economy and instant torque from electric motors. As for driving engagement, if you drive an SUV, forget about it. what if that was the US rating as well?? or what if they went a little higher to 200hp 330 lb-ft, would it make it attractive then even with the same-as-Gasoline mpgs? Imagine you are a salesman for the diesel CX-5. Give me 3 reasons I shouldn't get a RAV4 hybrid instead. I looked at the RAV4 hybrid. 34 MPG city and 30 MPG highway with 194 BHP. Doesn't have a torque number, but electric motors can produce torque from 0 RPM, so it won't have trouble to get you going. As much crap as we car guys give to Prius, it has a great and reliable hybrid system. 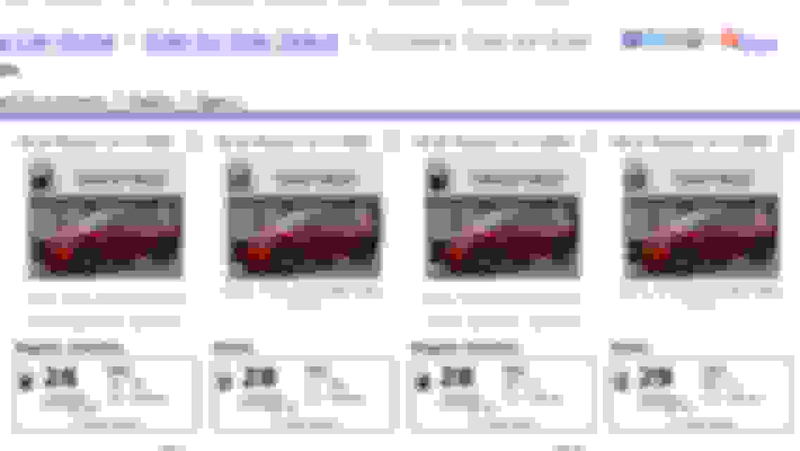 And like I said, if you are buying an SUV, don't worry about driving engagement. It just means it takes 10 seconds longer for me to fall asleep in a BMW SUV than a Toyota SUV. Welcome to the real world of diesel when ALL the pollution parameters are compliant. I was shocked by the EPA numbers - I wonder if Mazda wants this compliant engine to perform and excite the driver - hence is geared more for power than economy. This is opposite the Chevrolet/Opel/Holden Cruze Diesel concept (https://www.chevrolet.com/cars/cruze-small-car ) of economy over power yet compliant. Nope, I highly doubt they want this to be a more performance minded option as the 2.5T probably fits that bill better. what's shocking to me is I was chatting with a member of a different forum about this and I'm in agreement that it's the emisison regulations that doomed this poor engine's performance. here's what he had to say about the vehicle there. how dafuq did we lose 10+ mpg?! Last edited by Jedi54; 08-10-2018 at 01:26 PM. You say that as if an SUV can be exciting. I think the only SUVs that's close to exciting has to be the ones with bigger engines(Porsche Cayenne, etc), and even then it's still mostly because they will smack your skull against the seat harder. And AutoX events don't even allow them. Yeah, fun. here's what he had to say about the vehicle there.how dafuq did we lose 10+ mpg?! This video may help explain why the Mazda diesel gets disappointing fuel economy figures. It talks about how VW's cheat device works. Basically, it has a "good fuel economy & performance but bad emissions" mode and a "good emissions but bad fuel economy and performance" mode. They switch between the modes based steering inputs. Mazda doesn't want to lie about emissions, so they are stuck with the latter mode. Well, at least we now know why they haven't brought the diesels to market as of yet. 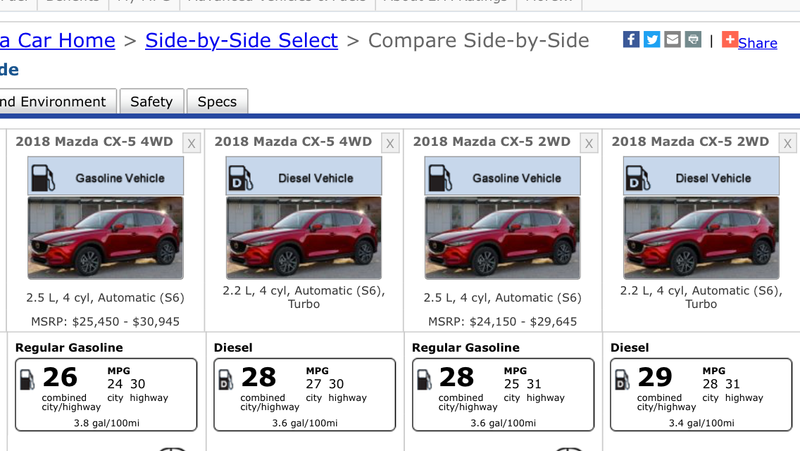 They literally can't put these on the lot next to the current cars, and try to wink wink nudge nudge the customers into believing that their fuel economy will be better if they buy it and drive it themselves, for several thousands more dollars on top of the cost of the top trim CX-5. And how exactly is the city mileage improved while the highway mileage is worse than the gasoline engine, anyway? For a hybrid, that makes sense. For a diesel, not so much. Last edited by Bladecutter; 08-11-2018 at 08:50 AM. BC: yeah, it explains a lot yet leaves me with more freaking questions. does DEF really **** up motor efficiency that bad? how is it that SAME motor (I think it's the same) gets 10+ mpg better in different parts of the world? and you're right, while I would HOPE this thing turns in better real world figures, there's zero chance in Hell you're going to convince someone of that when they're on the lot looking at this car and it's gasoline brother side by side that it's worth the extra money unless they really need the torque to pull stuff or the driving dynamic truly is that much better. If you are looking at European data, it's more likely to be using Imperial MPG, not US MPG. Also, the 2.2 Skyactiv-D in Europe puts out 172 HP, which is less than the 190 HP here. It's not surprising to me, honestly. My previous boss has a gas truck and he is pretty happy with it. He told me the diesel ones are not worth it. He has a family of 4 and tows trailers often, so if you live in North America and need to tow stuff, you may as well just get a truck. that's the full powered 2.2D with figures converted to US gallons. the difference in what he's getting and what the EPA just released is MASSIVE. "banning" is a little bit exaggerated term... diesel market share will plunge for sure here in EU, i think that Mazda will pursue a "niche strategy" for its cars. Big size SUVs and cars still will have a diesel version here in EU for the next 10 -15 years. Yep, I am sure people in EU will buy Diesels when they are being banned, allowed to be banned and or stop being made by car makers..